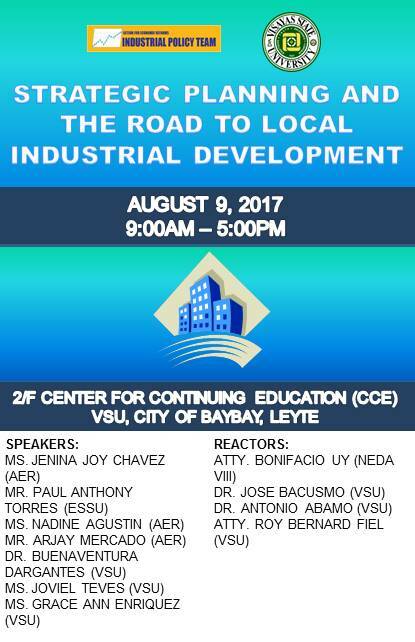 Action for Economic Reforms Industrial Policy Team (AER IP Team), in partnership with the Visayas State University (VSU), conducted a conference entitled: Conference on Strengthening LGU-Academe-Industry Partnership: Strategic Planning and the Road to Local Industrial Development last August 9, 2017 at the Center for Continuing Education, Visayas State University, Baybay City, Leyte. This was a part of the series of symposia that the VSU Institute for Strategic Research and Development Studies (VSU ISRDS). In Session 1: Industrial Development in the Philippines, Ms. Jenina Joy Chavez, the Coordinator of the AER IP Team, discussed the genesis of the book project on locating industrial policy in local development. Mr. Paul Torres, Instructor at the Eastern Samar State University – Salcedo Campus, talked about the Maze of Local Development Planning. To end the presentations for this session, Ms. Nadine Agustin of AER IP Team talked about the movers and shakers of local industrial development. For this session, Ms. Anilyn Costiniano (Chief for Policy Formulation and Planning for NEDA Region VIII) and Mr. Emmanual Licup (Manager, SC Global Coco Products, Inc.) gave their reactions to the presenations. For Session 2: Prospects and Potentials for Localizing Industrial Development, Dr. Buenaventura Dargantes, professor from VSU ISRDS, talked about the Local Prospects and Stakeholders Aspirations for Industrial Development in the case of Salcedo, Eastern Samar and Tolosa, Leyte. Ms. Grace Ann Enriquez, also from VSU ISRDS, discussed the fragile environment of the Agro-Fisheries Industry. This was followed by a presentation of Ms. Venice Ibanez from the VSU Department of Consumer and Hospitality Management, on the real and imagined potentials of tourism. Lastly, Ms. Joviel Teves from the VSU College of Management and Economics discussed the nascent industrial base of MSMEs. Dr. Antonio Abamo, the Dean of CME, gave a synthesis after all the presentations.